I need some help. I live in the Phoenix area, and need some advice on watering my garden. Specifically, EXACTLY how to water when planting vegetable seeds. I've already dug in compost, and I'm ready to plant. I'm pretty sure that my only marginal success in the past is due to watering issues. I've read everything I can find, but it's just not specific enough for me. Things like "keep the soil moist until the seedlings are established" just isn't that much help. If you were planting vegetable seeds tomorrow, and only had a garden hose to water with, how would you water, when would you water, how much? Does the soil really need to be constantly moist? Would I water daily? Twice a day? When do I change the watering schedule? My future vegetables and I thank you in advance. CM, somewhere in the Phoenix area. You are not going to like my answer. Just wanted you to know that in advance. If I were planting seeds tomorrow and only had a garden hose, I would keep the soil moist until the seedlings are established. I know, the same old advice. Problem is, it's good and sufficient advice. Let me explain why. We have, in much of our lives, grown accustomed to a certain precise relationship between inputs and outcomes. We open up a cardboard box, place the contents in the microwave for the specified period of time, and a perfectly cooked meal arrives. We open up another cardboard box, push Tab A into Slot B, and we have a perfectly balanced and functional piece of furniture. We open up another box, this one plastic, type in a specific combination of letters and symbols, and a perfectly functional Web site appears before our eyes. It's all rather comfortably predictable and precise. But the created world – the true created world, not our version of it – doesn't work that way. Deo gratias. The true world is full of mysteries and relationships. The true world – and that is the realm within which gardening lies – offers us an invitation, and it is an invitation to participation. We are free to accept or reject that invitation, but if we reject it, we reject its fruits (and vegetables), and if we accept it, we accept the continuing call to participation which it entails. What does this mean for your vegetable seedlings? Because we live in the desert, inadequate watering is, as you noted, frequently the proximal cause for mediocre results in the vegetable garden. But the ultimate cause is very often our belief that we can calculate our inputs, leave them to run, and expect good results. Gardener: Why do my plants look so bad? Me: The soil is completely dry and they need water. Gardener: But they're scheduled to be watered two days from now. Me: They need water today or they will die. Me: They'll be dead by then. Gardener: But I always water them on Saturday. The watering needs in your garden are determined not by the clock or the calendar, but by the complex relationship between sun, soil, humidity, weather and the type of plant you select. Your garden is unique to you; no other is precisely like it. It simply isn't possible for me to give you an exact schedule with precise amounts. That means you're going to have to water your seeds when you plant them and then every morning and evening go out there and see how things are going. Get down and stick a finger in the soil to make certain it's moist, and water if it's getting dry. Water gently, so you don't wash the soil away. Spread a layer of mulch around the seedlings once they sprout, to help conserve moisture in the soil. As they grow, water more deeply, to a depth of six inches or more, and then you can begin watering less frequently. How will you know when to water less frequently? You'll have to learn by watching and participating. If the days are hot and dry, you may water every day. If cool and rainy, maybe not for a week. You're going to learn to watch your plants: If they start to wilt after four days with no water, then perhaps you need to water on the third day instead. All plants need deep, but infrequent water. Learning what that means in practice takes, well . . . practice. I told you you weren't going to like my answer. If you have more questions as your garden grows, let me know. Mark Twain famously advised, "Buy land, they're not making it anymore." If you'll forgive my mangling Mr. Clemens' aphorism, allow me to alter that advice: "Don't buy soil, there's no need to make any more." Or something to that effect. That doesn't quite work, does it? Never mind. One of the most common themes I hear when talking to people about starting a vegetable garden is the need to "buy soil." I'm frequently asked what kind of soil is best to buy, or what kind of soil is best to buy for a raised garden, or, most distressingly: "I've dug all the soil out of my garden area and thrown it away; what should I buy to replace it with?" Frequently, the upshot of the assumption that soil is a commodity is the decision that one can't possibly plant a garden until one can "afford" soil, or until one's husband finishes building the raised beds, or until the nursery re-stocks a particular brand of vermiculite, or until one finds a better "soil recipe" than the one used last season. This is nonsense. With a very few exceptions, if you have a plot of land, you have all the soil you need. What you need, because this is the desert, is to improve the soil you already have, and that is very simple indeed. Select your garden spot and clear it of grass and weeds. Layer on top of your existing native soil a good 5 to 6 inches of organic amendment such as compost, or a combination of compost and manure. Using your spading fork, turn that layer into your existing soil to a depth of 10 to 12 inches. Rake it out, break up the large clods, and you're ready to go. Do you now have perfect garden soil? No. Good garden soil is not something you can buy, nor is it something you can achieve instantly. Good garden soil develops over time and there are no shortcuts. Each season, as you prepare for the next planting, repeat the process: layer, dig, rake, plant. 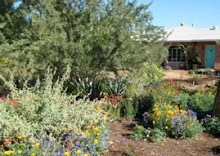 In the Desert Garden, with our multiple growing seasons, you can amend your soil three times a year. Start now, and by this time next year, you'll have very good garden soil; by this time the following year, you can modestly call it "almost perfect."